247 p., 3 ill., 14,7 x 20,8 cm. With contributions by Gerhard Fichtner, Stefan Goldmann, André Green, Ulrike May, Thomas H. Ogden, Marion M. Oliner, Christfried Tögel, Helga Wildberger and Jula Wildberger. In order to answer the hermeneutical question why Sigmund Freud writes with great astonishment in his Studies on Hysteria (1895), specifically in his epicritical notes on »Elisabeth v. R.«, that his medical case histories are to be read like ›novellas‹, the author of this paper points at the literary history of case histories with their topical enquiry structure, discusses the theory of the German ›novella‹, and sheds light on some prominent examples of the interrelation of both literary genres. The parallel between the contemporary aesthetic of the ›novella‹ and Freud’s case histories consists in the »psychic conflict« that both Freud, Empfängnisverhütung, Seplace in the centre of their literary presentation. The most famous dramatist of the Wilhelminian era, Hermann Sudermann, a close friend and medical patient of Wilhelm Fließ, did in fact treat, in a widely-read ›novella‹ entitled The Wish (1888), the same psychic conflict revealed and genetically reconstructed by Freud in his case history. A rarely known comment by Freud concerning the question of contraception, published in 1911 in the expressionist journal on literature and art Der Sturm is used as an opportunity to explore the context of this publication in Berlin. Four journals published in Berlin, dating between 1908 and 1914, are taken into consideration: Der Sturm, Sexual-Probleme, Die Neue Generation, and Pan. It becomes obvious that Freud’s participation in the survey of Der Sturm in 1911 was at the same time when the adoption of psychoanalysis in Berlin reached its first peak. 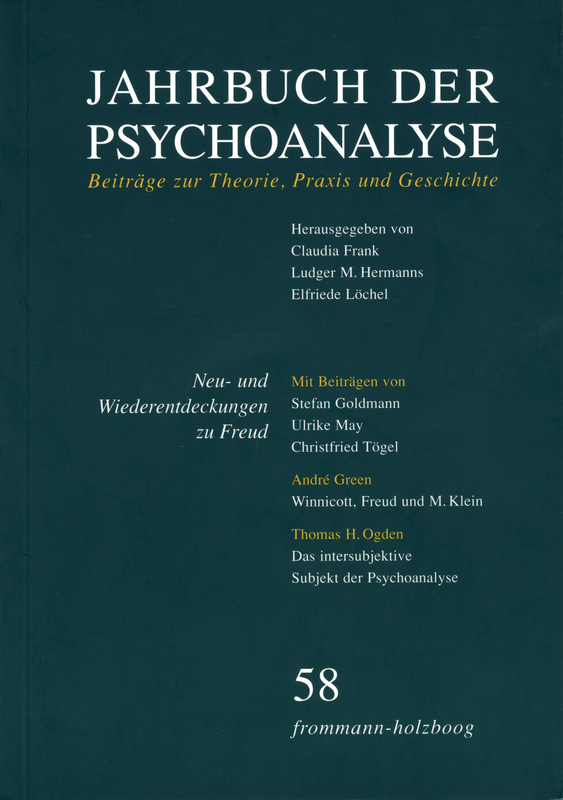 Freud and his pupils were publishing in the named journals, psychoanalytic texts were reprinted as well as reviewed and discussed – except in Der Sturm, in which Freud and the psychoanalysis were hardly noticed until 1914. The author and critic Alfred Kern and the young Theodor Reik from Vienna were the most important mediators of psychoanalysis in Berlin. The close connection between psychoanalysis, sexology, and sexual reform around 1910-11 could be specific for Berlin, as well as the adoption by a number of the expressionist artists. Furthermore, in the years prior to the First World War the four journals show a reserve, which, as the author assumes, was due to the now noticeable divergence of interests and the growing independence of psychoanalysis from the scientific, cultural and subcultural movements at the time. This paper traces the prehistory of the correspondence on Why war? between Albert Einstein and Sigmund Freud. At the beginning of the 1930s, the Institute for Intellectual Cooperation in Paris, an institution of the League of Nations and precursor of UNESCO, was able to convince Albert Einstein to get involved in an open-letter exchange between leading intellectuals. Einstein proposed among others to also contact Sigmund Freud. Most of the letters that have been exchanged between Einstein, Freud and the representatives of the Institute for Intellectual Cooperation are now being published and annotated for the first time. This disquisition complements A. Green’s earlier profound papers about Winnicott. A stringent analysis of Winnicott’s exceptional self-contained position between Freud and Melanie Klein is presented, under the particular consideration of the consensus/discrepancy of their respective drive theories and metapsychological assumptions. Winnicott’s contributions to psychoanalytic theory is of essential importance, especially his conception of play and transitional objects between inner and outside world which have lead to the conception of intrapsychic transitional processes, for example between individual instances, and Green’s development of the concept of thirdness. His conception and elaboration of the negative is based on Winnicott’s intuitive insight into negative processes. Winnicott’s poor adjustments to destructive processes are discussed on the background of the Controversies, his debates with Melanie Klein and her supporters. Moreover, his assessment of Masud Khan’s deviations are pointed out. Pitiless love does not suffice to explain destructivity. The present paper focuses on the contributions of Klein and Winnicott to a psychoanalytic conception of the dialectically constituted and decentred subject. Klein’s idea of »positions« represents a conception of the subject constituted in the creative and negating dialectical interplay of fundamentally different modes of attributing meaning to experience. The Kleinian subject is decentred in psychological space and in psychoanalytic time. The concept of projective identification provides the elements of a theory of the creation of the subject in the context of a psychological-interpersonal dialectic. The subject for Winnicott is not coincident with the individual psyche: »There is no such thing as an infant [apart from the mother]«. Winnicott’s notion of the creation of the subject in the psychological space between mother and infant involves a conception of the on-going constitution of the subject in the simultaneity of forms of dialectical tension between at-one-ment and separateness, internality and externality, I and me, I and Thou. In his Metamorphoses the Latin poet Ovid created not only the version of the Narcissus myth that gave Freud the name for a mental state or psychic organization, but also the figure of Invidia, personified envy. She is one of the characters in a story about Mercurius’s courtship of an Athenian princess, Herse, his negotiations with Herse’s sister Aglauros, and the intervention of Mercurius’s half-sister Minerva (Met. II 708-835). This paper proposes a psychoanalytic reading of this peculiar and, in many respects, surprising narrative by treating it as if it were the representation of a psychic world dominated by envy. In this world the various characters represent internal objects with different emotions and intentions. Ovid portrays the objects as co-operating or acting against each other. Emotions and intentions are displaced from character to character, as if they were being projected and introjected, so that the same object can appear in different forms. Increasingly the figures are fragmented into ideal and bad or devalued part-objects so that beneficial exchanges and creative relationships are no longer possible. This leads to the death of communication and to psychic petrification, exemplified by Aglauros’s transformation into a stone. The essay deals with the fact that I have never been able to find myself in the literature on »Object Loss« and trauma, despite having suffered massive losses in childhood and adolescence. The overwhelming positive response to my autobiographical presentation at the 2007 psychoanalytic Congress in Berlin prompted me to reflect once more on the difference between the actual experience and its depiction in psychoanalytic theory, and I came to the conclusion that the literature tends to lack the specificity that is needed to understand each person’s experience of trauma or object loss. I turned to the writings of Krystal who addressed issues pertaining to the actual experience of trauma. He stressed the narrowing of focus, the ego state resembling catatonia, and the suppression of uncertainty due to the need for clear perceptions. These life-saving defenses have a positive value during extreme situations, and taking them into consideration confirmed my own reactions, and appear to account for the fact that the listeners reacted as if I had allowed them to participate in my life. I concluded that there are »multivaried aspects of human experience, which, when simplified, are too often falsified«. Gerhard Fichtner: »... Krankheit, die hingenommen werden muss wie jedes andere Stück Schicksal«. Ein Brief Freuds an Dorothy Burlingham aus dem Jahre 1938. Dem Jahrbuch 58 liegt die mit der ›Psyche‹ gemeinsam herausgegebene Sonderveröffentlichung ›Konvergenzen und Divergenzen. Vorveröffentlichung der Hauptvorträge zum 46. IPA-Kongreß in Chicago, Juli 2009‹ bei.